My 12 year old went to the birthday party last night at a place called Laser Craze. This place opened last year I think. 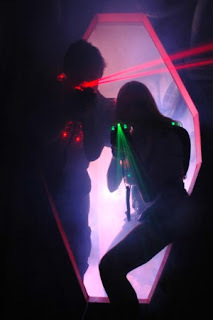 You play laser tag. Now to me that is so 80's. I remember it being a huge thing when I was growing up. I think they even had a Saturday morning cartoon called Laser Tag Academy. If they had a Saturday morning cartoon dedicated to it then it had to be big. I never played it, but it always looked fun. Anyway my daughter went and she loved it. They had a blast. I guess when you get there they split you up into different teams and then you have to get them with your laser and you rack up points. I didn't get to see it as I was at home with 12 screaming 9 year olds. I think it sounds like a great time and I'm thinking maybe we'll go back another time and play. My husband really wanted to get in on the action. That could be a fun thing to do on a rainy afternoon. I'll have to keep it in mind. Make It or Break It Okay For Tweens? Happy Birthday to My Youngest!